Barack Obama effectively accused Donald Trump of lying and “fear-mongering” about the migrant caravan making its way towards the US and warned Democrats not to be distracted during an appearance in Indiana days before the midterm elections. Without using his name, the former president warned the Republican administration was “telling us that the single most grave threat to America is a bunch of poor, impoverished, broke, hungry refugees a thousand miles away”. Mr Trump responded by accusing his predecessor of leaving behind a trail of broken promises on trade and the economic recovery. With opinion polls showing dozens of tight US congressional and gubernatorial races in Tuesday’s election, the current and former presidents said the results would determine what kind of country Americans live in for the next two years. “This election will decide whether we build on this extraordinary prosperity we have created,” Mr Trump told a cheering crowd in Macon, Georgia, warning that Democrats would “take a giant wrecking ball to our economy”. Mr Trump campaigned with Georgia Secretary of State Brian Kemp, who is in a tight race with Democrat Stacey Abrams for the governor’s office. Mr Obama condemned Mr Trump, without addressing him by name, and Republicans for what he described as their divisive policies and repeated lies. He hammered Mr Trump and Republicans for repeatedly trying to repeal his signature healthcare law while at the same time claiming to support the law’s protections for those with pre-existing conditions. “The only check right now on the behaviour of these Republicans is you and your vote,” Mr Obama told supporters in Gary, Indiana, during a rally for endangered Democratic Senator Joe Donnelly. Referring to the migrant caravan of mainly Hondurans men, women and children making their towards the US-Mexico border, Mr Obama said: “Now, two weeks before this election, they’re telling us that the single most grave threat to America is a bunch of poor, impoverished, broke, hungry refugees a thousand miles away. Opinion polls and election forecasters have made Democrats favourites to pick up the 23 seats they need to capture a majority in the US House of Representatives, which would enable them to stymie Mr Trump’s legislative agenda and investigate his administration. In the final stages of the campaign, Mr Trump has ramped up his hard-line rhetoric on immigration. He repeated those themes in Georgia, urging voters to “look at what is marching up – that’s an invasion”. 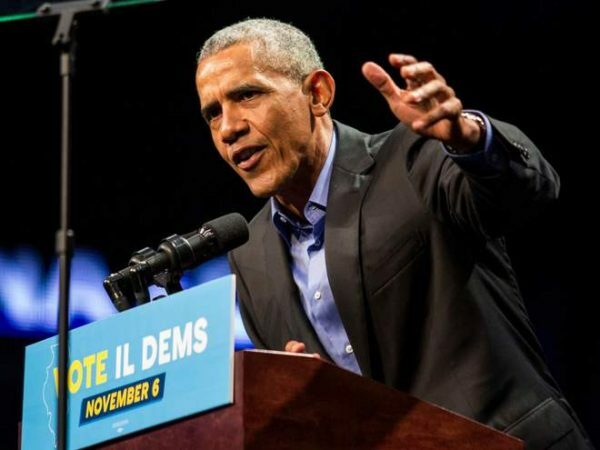 Mr Obama also appeared later on Sunday in his old home state of Illinois, which hosts a competitive governor’s race and several tight US House of Representative races. His appearance on the campaign trail is his second in three days. As of Sunday morning, almost 34.4 million people had cast ballots early, according to the Election Project at the University of Florida, which tracks turnout. That is up 67.8 per cent from the 20.5 million early votes cast in all of 2014, the last federal election when the White House was not at stake.